Timberland boots have made a huge impact on the fashion world recently. They’ve long been associated with New York street style and have finally made their way to the mainstream. 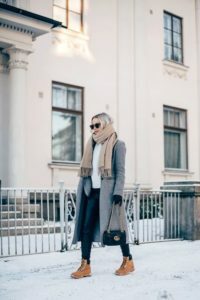 Whether you’re just starting to gain some interest in Timberland boots or you’ve been rocking them for a while, it can be tricky to figure out new stylish ways to wear the trend. As we enter a new season we thought it was the perfect time to give you a little additional fashion inspiration. New season = new style ideas! We have some timberland boots outfit ideas for you that we think you will love. We love how this outfit has a total girly girl vibe with Timberland boots. Styling an a-line skirt, tank top and big sunnies is an easy way to add that girly edge to the boots. This outfit is giving us major festival vibes. Monochromatic for the win, yet again! We’re all about monochromatic outfits this year, and so is everyone else. While Timberlands are traditionally seen in the camel color, they are also available in white. Aren’t they so fun in all white?! It makes it easy to create a chic, casual outfit. This outfit is a great weekend errands look. Athleisure at its finest with a logo sweatshirt, black jeans or leggings, a camel coat completed with timberland boots. The camel color jacket ties in the boots seamlessly. Accessories can completely change the look of an outfit, take this outfit for example. The core of the outfit is quite simple, a black romper (can also be replaced with a black dress) and Timberland boots. It gets a trendy update with 90’s inspired accessories like the bucket hat, fishnet socks and clear handbag. Yep, you can even style your Timberland boots with a business twist. Of course, it will depend on your office environment but even if you can’t wear this to work rock it to brunch! Dress up the casual boots with a blazer, statement handbag and scarf. Chances are you already own items in your closet similar to this, making it super easy to recreate. All you need are jeans, casual jacket/bomber, white shirt, big sunnies, and a structured handbag. The timberlands provide a street chic twist to the casual staples. We LOVE the chic level of this outfit. Combining sophisticated pieces like the tan long jacket and black jeans instantly elevate the aesthetic of the otherwise casual vibe of Timberland boots. The best part? It’s still a super easy outfit to style! Head out around town in comfort and style with this outfit. You don’t want to be dressed up all the time, but you still want to look put together. Trendy joggers and a white t-shirt don’t feel quite as casual when paired with Timberlands. This outfit is perfect for these early spring days when it’s still a bit chilly outside. Choose a light neutral color cardigan to pair with a white t-shirt and jeans for a cozy look with your boots. Add big sunnies and hoop earrings to complete the outfit. An unexpected pairing that works! We’re obsessing over this outfit combination. 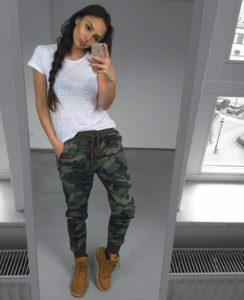 The white blouse and black pants traditionally have a dressed up vibe, when they’re styled with Timberland boots they get that tomboy street chic vibe for a whole different look. Why over complicate things when basics are such great go-to pieces? Casual style doesn’t have to be difficult. Throw on your favorite t-shirt, black jeans, and denim jacket and you’re good to go. The boots tie the look together for a stylish finish. There’s something about a flannel shirt that makes it a must-have for casual wear. This particular outfit is pretty simple to recreate. If you’re drawn to a tomboy vibe with your style you will love wearing this on your casual days. Call it a Canadian tuxedo if you want, we call it trendy. Layering multiple denim pieces in one outfit is a big trend this year and we couldn’t be more excited about it. Seriously, what’s better than denim?! As it gets warmer out, you can lose the denim jacket and still look great. Keep it cute with an edge in this outfit. 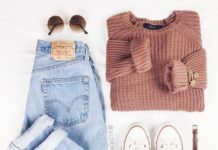 Now that spring is officially here, and summer just around the corner, you’re going to need some casual outfits for the weather. All you need is a simple black dress, denim jacket and a statement necklace to recreate this look. The great thing about neutral colors is they’re…neutral. Ok but seriously, they’re incredibly versatile colors. Don’t forget that you can mix your neutrals together in one outfit, too. This outfit is the perfect example of how mixing neutral colors is stylish and simple. We’re head over boots (get it?) for this outfit. It’s such a creative way to rock a casual outfit that’s loaded with style and personality. Layering collared shirts aren’t restricted to sweaters and long sleeve shirts either. This outfit can easily be transitioned to an evening look just by swapping out the shoes. Keep it trendy and comfortable in the summertime with an outfit like this. 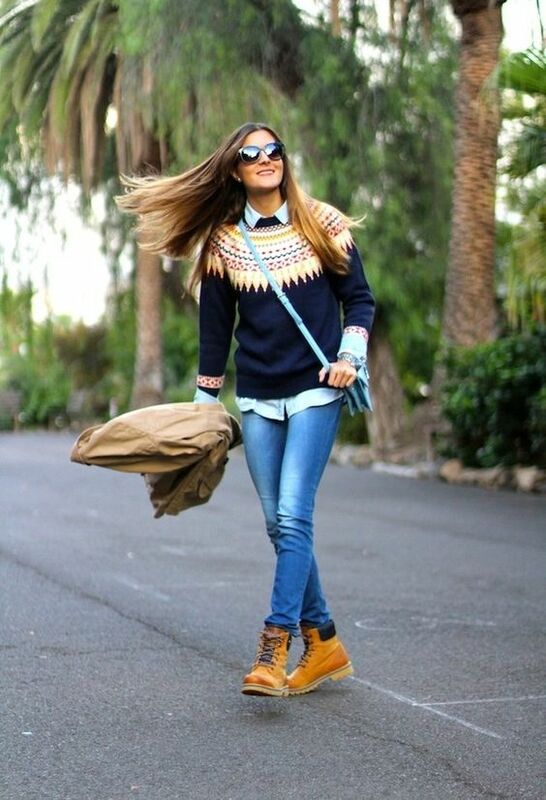 Timberland boots give the classic outfit combination an updated take, with a street style touch. Plus, the boots are comfortable for those summer days you’re walking around all day. There’s a lot of 90’s inspiration in fashion right now. Flannel shirts tied around the waist are a trend we’re happy to see right now. Doing something as easy as tying the shirt around your waist breaks up the solid colors in the outfit and balances the boots. Whether you’re heading out to a casual lunch or something else, there are days we all just want to throw on some leggings instead of jeans. Give your leggings an elevated style with an oversized graphic t-shirt, sunnies and Timberland boots. It doesn’t get much cozier than this! This outfit is the epitome of chic street style. Don’t you think? Making minor tweaks to wardrobe staples can instantly give you a stylish update. Like throwing a leather jacket over your shoulders instead of wearing it the traditional way, and rolling the hem of your jeans with your Timberlands. 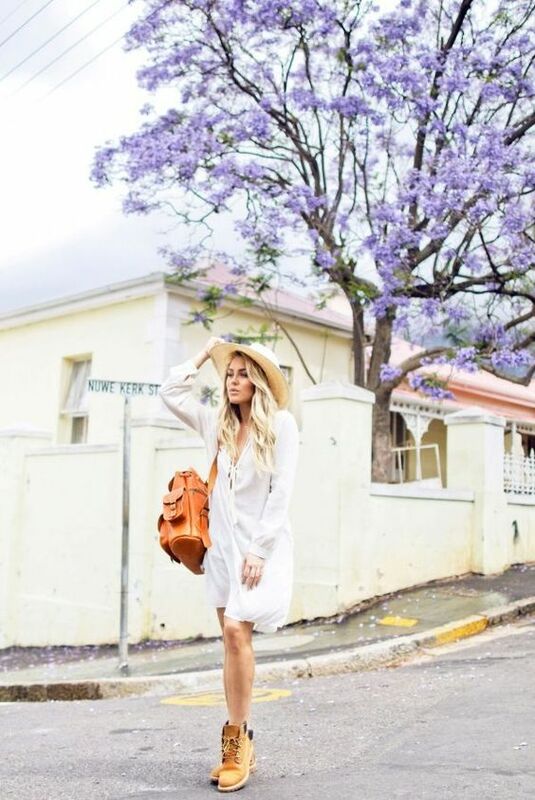 We love that Timberland boots are being worn in such versatile ways. Gone are the days of these boots only being worn with a basic jeans and t-shirt type outfit. Although if we’re all honest, there’s nothing quite like a jeans and tee – it will forever be a go-to! 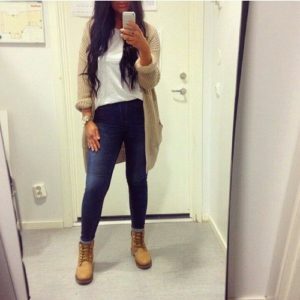 As Timberland boots have gained traction more and more women are styling them in unique ways to accommodate various style personalities. 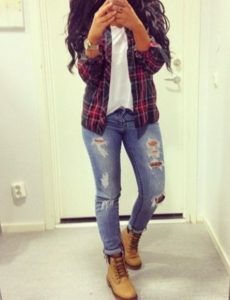 Yes that means even if you’re a girly-girl you can rock the Timberland boots trend. 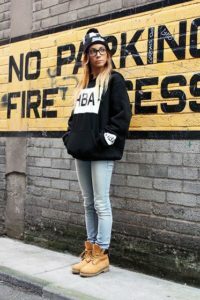 Timberland boots are a worthy wardrobe investment if you’ve been looking for something to add a bit of a tomboy-esque vibe to your style in a versatile way. Keep in mind that just because the boots themselves have a touch of that tomboy style personality, it doesn’t mean you can’t wear them to match your style. Aside from their aesthetics, Timberland boots are one of the more functional trends we’ve had recently. Think about it…they have a thick sole that’s perfect for comfort, the colors are incredibly neutral and versatile, AND they can easily be worn all year long. Does it get any more functional than that? If you live in an area that experiences various weather elements you know that finding a shoe that can be worn all year long is pretty uncommon. 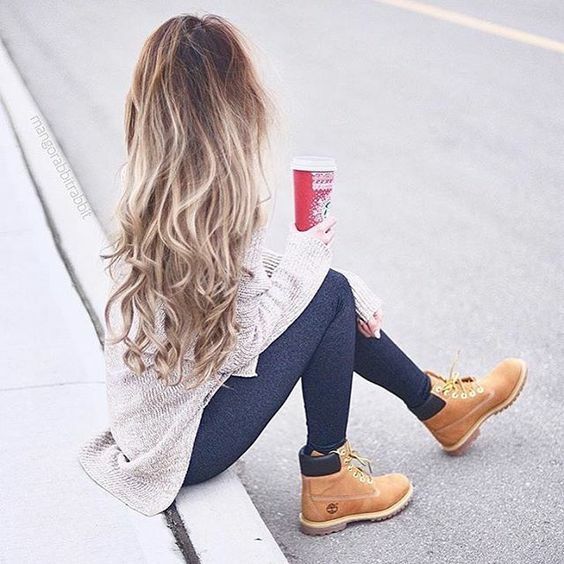 Our hope is that sharing some of these Timberland boot outfit ideas are helpful for you to wear the trend with pride this year. We know some of these outfits are a bit unexpected (in a great way). But it’s always the unexpected outfits that give us that added style inspo we need! Think outside the box when wearing Timberland boots and try to recreate some of these using pieces you have in your wardrobe. Happy styling!